Last term, some grad students and I read Berys Gaut's book Art, Emotion, and Ethics. Gaut argues that although some morally noxious works of art have aesthetic merit, they never have aesthetic merit in virtue of their moral defects. If an ethically flawed work is aesthetically good, it is good despite that flaw, not because of the flaw. I find myself inclined to disagree. Sometimes art is more thought-provoking, or more challenging or horrifying, because of its moral defects -- thought-provoking, challenging, or horrifying in ways that make the work more engaging, giving the work a kind of aesthetic interest in virtue of its moral terribleness. (1.) In praising the aesthetic merits that morally noxious artworks sometimes have in virtue of that very noxiousness, I don't commit to the view that being thought-provokingly morally awful outweighs other considerations. Some of these works should be overall condemned. Even just appreciating them aesthetically might be overall inappropriate, despite their merits. And the world might be better off had the works never been produced. (2.) I am (like Gaut) assuming pluralism about aesthetic value. Aesthetic value does not reduce entirely to beauty, for example. Being thought-provoking, challenging, or frightening can be (though it isn't always) as aesthetic merit in a work -- can be part of what makes a work aesthetically valuable. Two examples I've given some thought to are both films: Leni Riefenstahl's Triumph of the Will and Woody Allen's Crimes and Misdemeanors. Riefenstahl and Allen are of course both morally flawed people themselves: Riefenstahl a Nazi propagandist, Allen plausibly accused of inappropriate sexual conduct with minors, including in his own family. The moral noxiousness of their work might flow in part from their own personal ethical flaws -- but I don't want to rely on such biographical facts in evaluating the works. I discuss their work with considerable trepidation, because of the electricity of discussions of Nazism and of sexual abuse. Let me be clear that I will not be saying that their work is good despite its moral awfulness, as though we could simply bracket moral issues in aesthetic discussions. Instead, my view is that it is the moral awfulness itself that makes these otherwise not-so-great films interestingly distressing to contemplate. Consider Triumph of the Will. The film is fascinating, in part, because it is both (sometimes) beautiful and a work of Nazi propaganda. There's a horrifying tension between the beauty of the cinematography and the ugliness of the worldview it celebrates. It would not be nearly as horrifyingly fascinating if it didn't star Hitler -- my god, there he is, arguably the most evil man on Earth, being fawned over! -- if it were, say, a piece of Allied propaganda rather than Nazi propaganda. Furthermore, the fact that it is Nazi propaganda is not independent of the aesthetics of the film: It's not simply a beautiful film that happens (by sad chance) to be Nazi propaganda. The fascistic perspective is itself visible in some of its scenes -- for example, in the striking shots of masses of seemingly-identical troops standing in huge, almost inhuman formations, in the unity and uniformness of the crowds' mood and action, in the extreme deference to Hitler, in Hitler's superficially tempting sham-ethical perspective as he praises people who sacrifice and submit everything for the good of Germany and the new Reich. Triumph of the Will is fascinating not despite, but because of its moral horribleness. Proper viewing of it requires keeping that horribleness always in view at the same time one feels pulled into the beauty of a shot or feels sympathetically how an ordinary German of the period might be emotionally moved by Hitler's calls for self-sacrifice. Allen's Crimes and Misdemeanors is also, I think, fundamentally morally noxious, but in a different way. The film is clearly intended as a refutation of the idea of "immanent justice" of the sort one sees in Shakespeare and Dostoyevsky: the idea that crimes bring their own punishments naturally in their train. In Shakespeare's Macbeth, for example, the title character murders King Duncan, and this leads to other crimes, and torments of guilt, and fear, and ultimately a terrible death. In Dostoyevsky's Crime and Punishment, Raskolnikov commits a robbery, and it too leads to another crime (murder), and subsequent horrible guilt and fear; he never benefits, and he ends up driven to confess. Allen's plausible starting point is that the world doesn't reliably work this way. Often people commit horrible crimes, and get away with it, and don't feel too bad about it, and are better off in the end for having done so. As I've stated it so far, this isn't yet a claim about what one should do. It's just how the world happens to be, as portrayed in the film. The central ethical question of Allen's Crimes and Misdemeanors is how to approach life in light of the failure of immanent justice, that is, given that the wicked often flourish. Hypothetically, the message of the film could have been that you should act ethically anyway, even if you'll be worse off as a result, even if Shakespeare and the Bible and Dostoyevsky and children's tales are wrong, and crime does pay. That is presumably what Mengzi would say. But that is not, I think, the perspective conveyed in the film. In the perspective of the film, the lead character Judah, who murders his mistress so that she will not reveal their sexual affair to Judah's wife, proves to be the wisest character in the end. Wiser than the rabbi Ben, who thinks that you must have faith in God and trust in the moral order of the world, and wiser than Allen's own character Cliff who thinks that it would be unbearable to have an unconfessed murder on one's conscience. By the end of the film, Judah appears glad that he committed the murder in order to save his relationship with his wife. The implicit message of the film is that if morality conflicts with self-interest, sometimes the wisest course is to act unethically -- even to the point of murder to hide a sexual affair. As Judah's brother Jack says, "you only go around once." Don't let anyone else, or the demands of morality, ruin it for you. If this interpretation of the film is correct, then the film is morally noxious -- indeed, proudly so. (In its self-conscious rejection of morality, the film differs from Triumph of the Will.) This morally noxious message is central to the film's aesthetic interest: It is what makes it horrifying and dark, and a challenge to think through, and a lively criticism of Shakespeare and Dostoyevsky. If it didn't celebrate Judah's evil choice in a way that most of us would find morally odious, it would be a forgettable film. Contra Gaut, artworks that unapologetically celebrate evil, whether in full moral knowledge that they are doing so (Crimes and Misdemeanors) or without full moral knowledge (Triumph of the Will), can be aesthetically interesting exactly because of their moral noxiousness. They can be horrifyingly aesthetically fascinating, like a disaster that we loathe and condemn at the same time we can't look away -- but we needn't wish such disasters on the world or comfortably enjoy viewing them with a mouth full of popcorn. March 9 ETA: I've been getting interesting pushback about my interpretation of Crimes and Misdemeanors (e.g., Taylor and Howard here. Let me say that the basis of my interpretation is primarily that, as I see it, Judah (the murderer) comes out looking wiser than any of the other characters. If the film were to be neutral between Judah's perspective and more moral perspectives, it would need, I think, a character who clearly recognizes the world's lack of moral order and yet chooses morality nonetheless. There is no such character. Here is a parallel idea. Whenever I watch Triumph of the Will and Taxi Driver I have the same feeling of sliding into a pit. 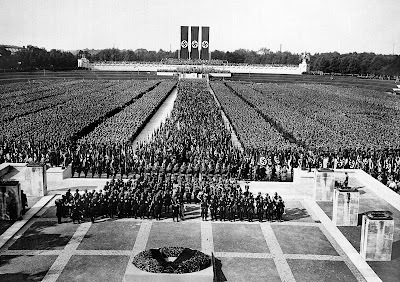 Riefenstahl reminds me of Scorsese, the Hollywood film Director, and Taxi Driver is Scorsese's Triumph of the Will. The two films begin like Ingmar Bergman's The Seventh Seal. Pensive. Lugubrious. ("Look how sophisticated pulp-cinema quasi-fiction can be!") But, both films are like a supernatural MyPillow commercial tantalizing insomniacs. Both films project (at the start) their version of an idealized world. Both films progress, by increments, like a conveyer belt of indoctrination. Both films, start as abstruse art films, as a hypothetical tone poems, with idealized notions, a mythological fire snatched from Olympus moving inexorably to Berlin, or (in Scorsese's case) an elegiac fog enshrouding a yellow taxi passing along the river Styx, the flowing summer asphalt of Manhattan. But both films reach a jarring cognitive crescendo that cauterizes the consciousness of cinematic captives after about 45 minutes. Certainly these two films (Will/Taxi) have high pretensions, giving the audience high expectations. Tragically, the gap between aspiration and delivery creates a cognitive dissonance that is hard to reconcile by any audience, anywhere. The films' denouements sink into garish tabloid journalism with Travis Bickel, suddenly, (despite fixations of paranoid mania) is herald by the media as the "hero" who saved the young girl (Jodie Foster) during a bloodbath. Ironically (in parallel fashion) we can say that Triumph of the Will portrays Adolph Hitler as the "hero" who saves the young girl (Rhineland of Wagner) during a bloodbath, both instigated by Bickle/Hitler. Eric, I would like to do a comic book with your (and a fraction of my) ideas.